If you’ve never been to Lancaster County, Pennsylvania; then you definitely have to come for a visit. You might not even want to leave. While this is my hometown, I’m still finding so much new and fun stuff to do and see and eat, it’s constantly changing and growing. It’s always fun to play tourist where you live. Well my children went to visit with my parents for the weekend so I decided to try something I’ve been dying to do but just haven’t had the chance yet. 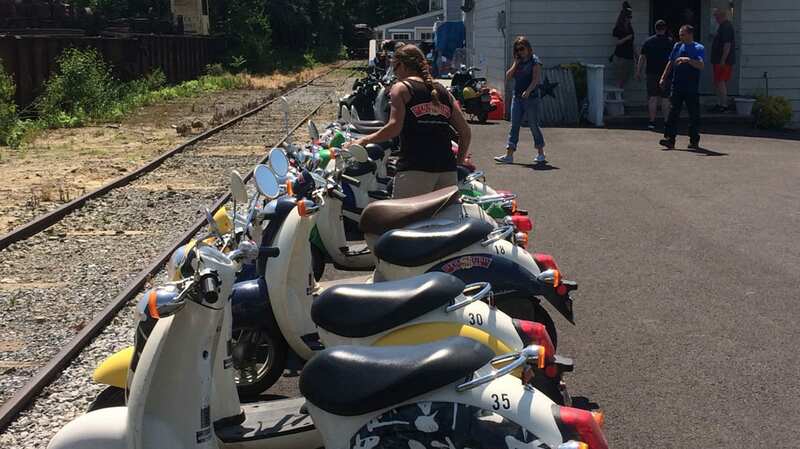 It’s a scooter tour with Strasburg Scooters, located right in Strasburg by the train station. Marc and Nikki Crusemire for providing a complimentary tour. I highly recommend you try one of their tours. It was so fun and the guides are very informative. My ticket was for the 3 hour ride on a single scooter. While I’ve ridden ATVs, tractors and so forth; a scooter was a new experience but now I want to buy one. You’ll start out your experience by checking in and getting fitter for a helmet. As you go back outside to pick your scooter, the tour guides will come around and explain step by step how to start it and what the controls are. You’ll need to be there 45 minutes before your tour starts. The scooters are simple to understand and they have you go about ten feet back and forth until you’re comfortable operating it. Then they’ll send you for a ride around the block to get used to riding with traffic and turning. Once your whole group is comfortable, off you go! The tour takes 3 hours and is about 40 miles around the back country roads of Lancaster. Our tour guide was Ross. Safety is a big priority so your guide will explain how to cross each intersection and wait to make sure everyone gets across safely. As we rode along, he would stop and explain what certain buildings and places were and provide information about the Amish and their way of life. A neat aspect of the tour is they stop at Amish homes along the way and give fruit snacks out to the Amish children. They hear the scooters and run to the road to meet him. It was so cute, they started doing this about 4 years ago with permission from their parents. The views on the tour are amazing, I fell in love with this county all over again. Stop by if you’re in Pennsylvania and take a ride!